Having a local company that you can interact face to face with is still a huge value to many people. We understand this and value being able to meet in person with our Lodi and Stockton website clients. In addition, we enjoy being able to serve members of our San Joaquin Valley community by providing them with websites that promote and grow their businesses. iSelect provides many options to our customers ranging from one-page responsive websites for $99 all the way to complete custom websites built with Drupal CMS. We specialize in custom websites so that your brand and website are unique to you and are customized to work best for your customers. We also offer several package plans that utilize premade templates so that if you have a smaller budget you can still have a beautiful website. In addition, iSelect can host your website so that it is visible to the world. Lodi Area Crime Stoppers, Inc.
iSelect Internet has been doing custom website design out of our local office in Lodi, Ca for over a decade. We are located inside the Wine Country Plaza on Kettleman Lane. Go inside the main lobby and our office is on the right. 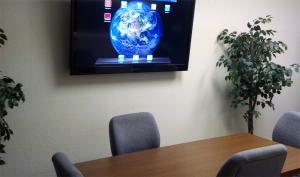 Our conference room makes it easy to strategize with customers and review competitor’s websites on our HD television. We implements Apple TV so that we can mirror our iPhones and iPads onto the HDTV screen so that what we see on our small device is large and visible for the whole room to view. In addition, we can project our PC’s screens onto the TV by using AirParrot. The point of all this is that we want it easy for our customers to interact with us as we review websites.